If an organization hires great people, but doesn’t get the business results it needs, there may be a good reason. Consider Greg Long, vice president of organizational excellence at RWD, a division of GP Strategies, and an aeronautical engineer who, at one point in his life, decided to take flying lessons. During a lesson, Long looked out his window from the co-pilot’s seat and noticed a corkscrew vortex on the wing tip. He described to the pilot the atmospheric conditions, wind speed and wing configuration that must align to make this sort of thing visible. His friend looked at him blankly, pushed forward on the stick to dip the nose of the plane and said, “Greg, all I know is, when I push the stick forward, houses get bigger, and when I pull it back they get smaller.” Long concluded that while hiring pilot candidates with the right personality traits and education is important, he would only put his fate in the hands of someone who he knew could actually fly, as opposed to someone like himself, who only knew about flying. Many organizations base hiring decisions on personality traits measured by tools such as the Myers-Briggs Type Indicator. Then they train to competencies defined for the roles new hires will go into, without paying enough attention to capabilities and, more importantly, to the accomplishments or job requirements needed (Figure 1). An airline pilot and an accountant may have similar personality traits such as an “attention to detail” and “a reluctance to take chances.” When it comes to competencies, they deviate a little, but can still be quite similar. It’s not until the focus turns to what employees are expected to accomplish in their jobs that it becomes apparent why it’s short-sighted to stop at the competency stage. Personality-based hiring and competency-based learning won’t achieve what matters most to a business. It is not until an employee’s accomplishments are identified and used as the backbone for training that results become more predictable. Whether a person is in sales, management or operations, a performance-based learning approach that focuses on accomplishments is critical to ensure development and employee support efforts yield desired results. The top half of Figure 2 represents the way work gets done. People are equipped with skill and knowledge to perform tasks that produce outcomes that subsequently achieve business goals. Traditionally, learning is built in the same direction, starting with capturing all the skills and knowledge the employee possesses. This process doesn’t consider that only a subset of those skills, knowledge and tasks are needed to produce outcomes the business values. For example, let’s say the quality of paint finish on new cars at a manufacturer is less than optimal. Engineers determine the cause is the variation in paint viscosity and paint booth operators’ failure to properly compensate by adjusting the paint guns. Engineers and the learning department work together to develop a learning program on viscosity and its effect on paint equipment. In the interim, an operator whose cars always turned out well is asked how he consistently achieves quality paint jobs. He responds that he knows nothing about viscosity, but he does know he needs to clean the tips of the paint guns with a cotton swab he carries with him whenever he changes paint. When developing a program to support workplace performance, start at the other end of the spectrum as shown in the lower half of Figure 2. First, define what success for the role means. Then identify the outputs produced that lead to success and the tasks used to produce those outputs. This approach ensures learning programs focus on teaching the specific skills and knowledge needed to be successful, not everything an expert might know and do. In the paint finish example, asking an expert led to development of a job aid for operators rather than a learning course on paint viscosity. Figure 3 offers another way to look at this approach. If learning leaders define the specific outputs of value an employee needs to produce first, they can clearly identify the actions needed and what subject matter is required to be successful. This results in a leaner, more focused program with greater impact that moves learners toward competency faster. The next step is to develop a job role profile. Observation and interviews with high performers can be used to create a role profile that clearly identifies the accomplishments or value outputs created by that role and the tasks that need to be executed to create those outputs. Again, hiring people with the right personality traits and competencies is important, but until the needed job outputs are clearly defined, there can be no assurance those capabilities will be applied in the right way to the right things to achieve business value. Since high performers often do their jobs without thinking specifically about the steps they take, observation can be the only way to get a clear view of what an expert does. Think about asking Long’s flying mentor how he lands in a crosswind, and he would probably say he just feels it and adjusts accordingly. However, another pilot observing him in action likely would uncover the gauges he observes, the altitude of the plane he “feels” and the corresponding actions he takes. 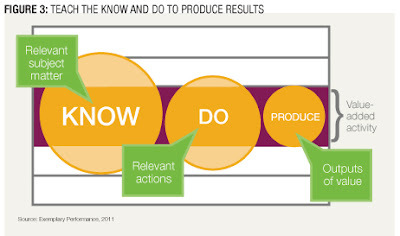 Then the cause and effect and associated actions can be captured and codified in training. Outputs or accomplishments vary by role. For example, Figure 1 reveals that a valued output for an airline pilot is a safely landed plane. For the accountant, it’s a properly filed tax return. For a service provider it can be a customer who is also an advocate. Once the role profile is established it becomes the backbone of the learning curriculum as shown in Figure 4. The outputs become courses, and the tasks to create the outputs become modules in the course. • Learning is focused on things needed to produce desired outputs. • The learning program is lean with no unnecessary time or effort. • Assessment in the field is tied to the profile and outputs allowing objective performance assessment. • Remediation can be clearly directed to the learning assets associated with tasks that need improvement. This type of structure supports the hiring process, allowing candidates to see clearly what’s expected of them and reassuring new hires learning is designed to support them in successfully meeting these expectations. It also aligns field coaching and assessment so HR and learning leaders are speaking the same language and working toward common goals. There is more involved in an effective learning and performance program, however, than curriculum design itself. A blended approach can be most effective to enable the workforce to produce desired outcomes. Traditional reliance on formal, structured learning to improve performance is often misplaced because learners may not remember what they are taught long enough to use the information. 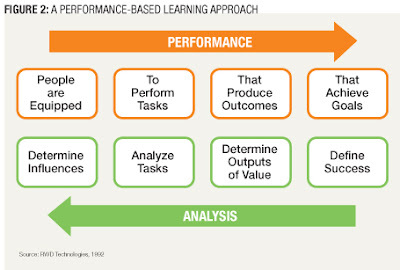 Business outcomes are realized from using a blend of learning, performance support such as job aids and collaboration, which form an Integrated Job Performance Model (Figure 5). At the core of all three components there should be a thriving community of practice where people consume and contribute information, stories and advice. 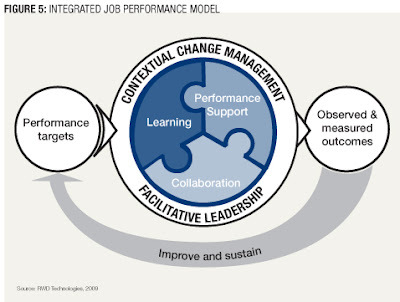 Communities of practice enable top performers to shine and share to help shift the performance curve for the front-line performers as shown in Figure 6.
preparation to ensure employees understand why their performance is important, how it needs to change and what support they will have — and facilitative leadership — leaders’ support, endorsement and governance in the workplace. Without these two aspects of the model, the probability of recognizing desired operational outcomes and sustainable value is small. 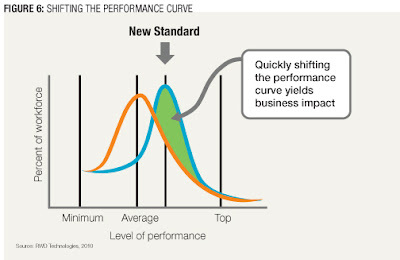 The overall effectiveness of the Integrated Job Performance Model is driven by appropriately defining performance targets for the job — the outputs of value defined in the role profile. Then, the performance observed and measured in the field can be effectively assessed against role profile criteria — the same criteria that made the best who they are. When gaps in performance are observed, it is easier to identify what needs to be done to close the gaps because the learning and performance program was designed around clear outputs and tasks. To hire people with the “right stuff” and accelerate their ability to drive business results, learning leaders should build role profiles for the best performers and use them to build strategy for learning, performance support and collaboration. The same strategy applies if leaders need to energize current employees and optimize their performance. By moving beyond a reliance on personality-based hiring and supplementing it with a blended, outcomes-based development approach, performance becomes more solutions-oriented and collaborative. That delivers the results leaders were after when hiring great people in the first place. It’s a different way to think about learning, but one that will net greater performance for an organization in the end. Rick Contel is director of strategic consulting with RWD Technologies, a division of GP Strategies, a global provider of human performance improvement services. He can be reached at editor@CLOmedia.com.